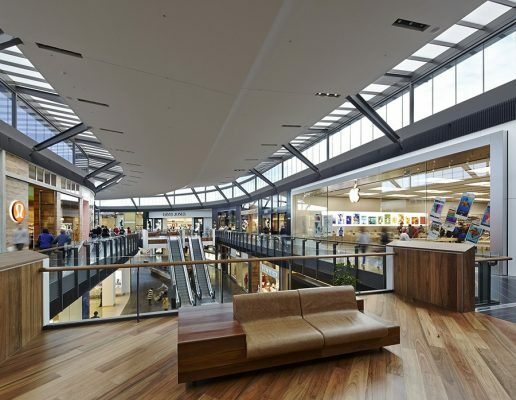 The $300M North West Precinct development of Highpoint Shopping Centre was announced as the Winner of the Victorian Development of the Year at the 2015 Property Council of Australia / Rider Levett Bucknall Innovation and Excellence Awards. Congratulations go to owners GPT Group; Highpoint Property Group and GPT Wholesale Shopping Centre Fund who received the award for the expansion, which introduced 100 new specialty stores to Highpoint and a new David Jones department store. The Buchan Group, in association with Grimshaw Architects, provided Architecture, Master Planning and Retail Planning services. The Buchan Group has worked on every stage of Highpoint’s development. Located in Melbourne’s Maribyrnong business district, Highpoint Shopping Centre is one of the nation’s largest retail outlets. 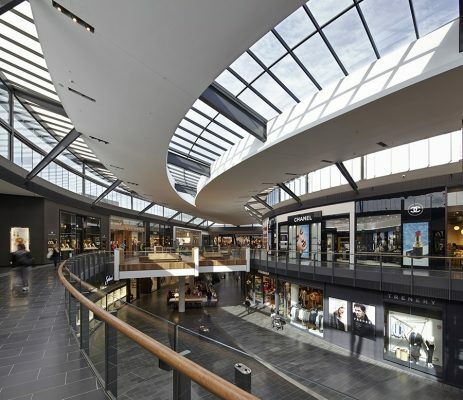 The expansion has unveiled a world class shopping precinct boasting some of the best fashion offerings in Australia with around 520 stores and over 7000 parking spaces. The Buchan Group’s CEO, David Martin attended the awards presentation and said the redevelopment has created a greatly improved centre for customers, with the innovative design response and introduction of international retailers bringing a true destinational quality to the centre. A new benchmark for retail and sustainable design was established through the redevelopment of the centre, with the design challenging the traditional, introverted model for retail, and promoting stronger connections with nature and the environment. A correlation to the surrounding environment was achieved through views, natural materials, exposed beams and the creation of naturally ventilated spaces which respond to external conditions. The most striking design feature is the floating transparent roof structure which flows throughout the mall and brings in natural light and fresh air. 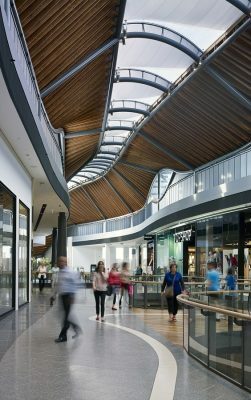 The design philosophy throughout the centre has helped to redefine the retail experience and shift the perception of Highpoint to that of a world class shopping centre where people want to shop and play. The redevelopment has essentially created a new and exciting narrative for the future of Highpoint and its customers. The North East Precinct of Highpoint Shopping Centre was designed by Grimshaw Architects working in association with The Buchan Group. 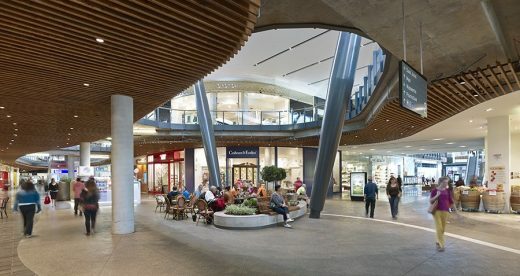 Located in the suburb of Maribyrnong, Highpoint Shopping Centre is eight kilometres north-west of Melbourne’s CBD and serves the city’s western suburbs, commanding one of the largest regional trade catchment areas in Australia. Grimshaw were approached by the property co-owner, The GPT Group, to provide a concept design for a new 30,000sqm extension to the existing shopping centre. While Grimshaw have undertaken numerous transport and aviation projects that incorporate retail outlets in a supportive role, Highpoint is the first retail centric project since their acclaimed Sainsbury’s building in Camden, London. Grimshaw challenged existing retail perceptions by breaking down the traditional inward-looking approach. Importantly, the new Highpoint creates a vibrant public realm with strong connections to the surrounding environment, landscape and community. 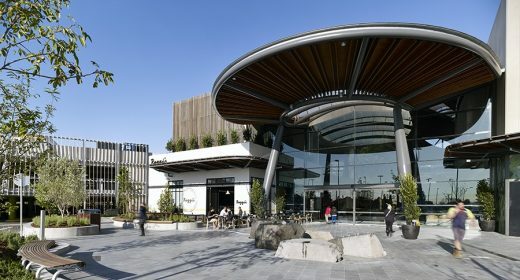 The redevelopment comprises two new unique fashion malls and a fresh food market, including approximately 120 specialty retailers and the first David Jones department store in the western suburbs. The design challenges existing retail perceptions by breaking down the traditional inward-looking approach. The new Highpoint creates a vibrant public realm with strong connections to the surrounding environment, landscape and community. Both environmental and social sustainability are core themes of the design, with the mall areas conceived as beautiful public spaces which celebrate fresh air, daylight and sunlight. The operable facades of the building allow natural ventilation throughout whilst promoting a greater association with the outside weather conditions. ETFE is used within the building’s skylights to provide a lightweight and sustainable alternative to glass. The design also uses other initiatives, including rain water collection, extensive landscape swales within car parks to treat surface water and careful material selections. In addition to an environmental response, the design focused on creating a meaningful public realm. This has been achieved by breaking down the development into a series of smaller ‘places’ which have their own unique identity and character. This approach resonates with the context and people of Melbourne’s western suburbs, differentiates Highpoint against its competition and creates much stronger retail offer. The use of varied materials also reflects the vibrancy and diversity of the surrounding community. It is appropriately cost effective and where possible natural materials are used throughout the scheme, including timber, blue stone and bare concrete. The new Fashion Mall takes the form of an elegant crescent that creates views which change and unfold as the shopper moves through the space. Inspired by contemporary art galleries its form is defined by the quality of light, order and calmness. 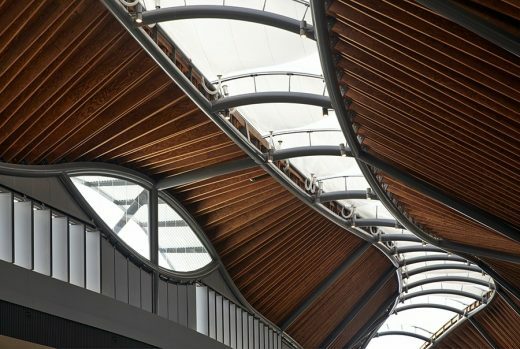 Its floating roof reinforces the sweeping curve, while full height glazed louvres above the shop fronts continuously open and close in response to environmental conditions. In contrast, the Eco Mall has a more organic form. It is a fluid structure built from timber and courses through the site- connecting precincts; new and existing, inside and out, food and fashion. The Eco Mall’s geometry responds to the constraints of the existing site, whilst its undulations celebrate vertical movements and gathering spaces. Grimshaw brought to this development their pragmatic response to design and broader urban considerations whilst ensuring sustainable solutions were provided where viable both functionally and aesthetically. The result is a beautiful, flowing piece of architecture meeting both the client’s brief and also responding organically to the surrounding community and breaking away from traditional retail models. Grimshaw have succeeded in providing a fresh approach to retail design by utilising their broad international experience over varying sectors to enable a comprehensive and educated solution to the Highpoint centre. Grimshaw Architects were responsible for the design of the new NE Precinct of Highpoint and worked in association with retail experts The Buchan Group. Grimshaw’s experience in sustainable design and Buchan’s retail expertise combined to create a quality destination that reflects the changing demographic of Melbourne’s western suburbs and delivers a premium retail offer in a unique environment that has been embraced by the community and retailers alike. Design start Date: Dec 2009.